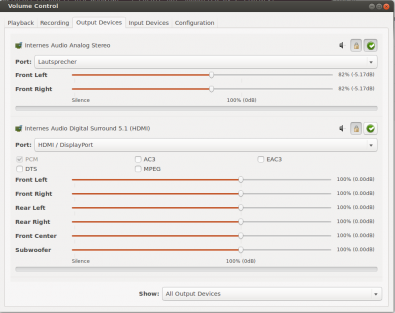 This page goes into detail on using PulseAudio on Linux systems. PulseAudio is used when Kodi is installed in a desktop-environment rather than a dedicated/direct boot setup. PulseAudio allows normal video & audio playback in XBMC while at the same time allowing the user to get audio in their browser or other applications. It also allows Kodi playback of video or audio to be paused in order to run a game, Skype or similar. Kodi is set to only use PulseAudio if you have installed it and running. 6.1 When would I want PulseAudio? 6.2 When would I want ALSA? 6.3 Why can't I have both? 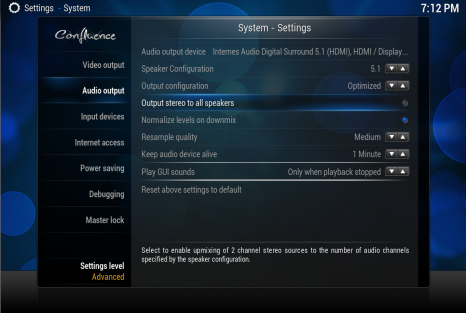 6.4 Can I force ALSA even with PulseAudio installed? In the past users have experienced problems with audio not working within Kodi, because they were running a full-blown Ubuntu desktop environment with PulseAudio installed. This happened because PulseAudio blocked the device Kodi required, and audio playback only worked reliably when using the virtual Pulse device. Our workaround for those users has been to uninstall PulseAudio which completely broke desktop audio. For XBMC 13 'Gotham' and later (named Kodi since 14 'Helix') we wanted this situation to change, so thanks to the new PulseAudio Sink users now can run a normal Ubuntu desktop. PulseAudio will be automatically detected and selected in Kodi when it is running. Passthrough Mode Used if you want to passthrough (bitstream) AC3, DTS, and EAC3 to an AVR or other device. In order to allow passthrough to work with PulseAudio then it MUST be set to use a 2.0 channel configuration, despite the 2.0 setting this will still allow 5.1 audio from AC3, DTS, and EAC3. Used if you want Multichannel PCM out, in this mode you can configure PulseAudio for up to 7.1 channels. In this mode Kodi must decode all audio formats to PCM for passing onto the PulseAudio, this can have the advantage of improve audio/video sync. In the case of video with TrueHD/DTS-HD 7.1 audio this must be decoded by Kodi to Multichannel PCM by disabling passthrough, then Pulseaudio can handle the 7.1 channels of audio. Note: Audio decoded to PCM and sent through PulseAudio the audio will not likely be "bit perfect". As Pulseaudio will always open the number of channels you have configured. You can stop it doing upmixing (see Known issues), but it will still open all configured channels which makes Dolby Pro Logic II of your AVR not usable. IMPORTANT: Passthrough is always an exclusive mode. If you have another application hogging the device, e.g. Chrome or Skype, passthrough won't work. Even applications that simply monitor the device, such as SoundWireServer, will prevent passthrough from working. 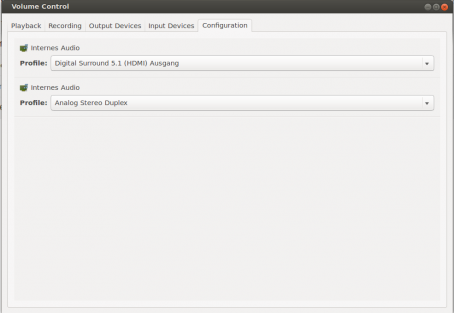 Step 1: pavucontrol Output Settings. pactl set-sink-formats 0 "pcm; ac3-iec61937; dts-iec61937; eac3-iec61937"
You can leave out the codecs your AVR does not support, always keep pcm. IMPORTANT: If you have for example 5.1 flacs or other multichannel files, you can play them as AC3 streams, check the AC3 Transcoding setting. IMPORTANT: Enabling Sync Playback to Display will disable passthrough silently, as it makes zero sense to sync with a display clock while one cannot alter audio. To configure instead Multi channel mode, do the following settings. Step 1: To alternatively configure Multi channel, check this:. Step 2: The Add-on manager, displaying four/five options (explained below). GOOD TO KNOW: Limit sample rate can be set to Fixed - between 48kHz ~ 192kHz or as Optimized and even Best match. Step 1: to be edited Output Settings. Step 2: to be edited Configuration. DEVICE ENUMERATION: Kodi Enumerates Pulseaudio devices as SPDIF when you have Passthrough set. Otherwise its PCM Device. If Passthrough was not configured with pavucontrol - no Passthrough setting within Kodi will be available. GOOD TO KNOW: SPDIF has 2 pcm channels but can do virtual 5.1 formats like dts, ac3, eac3. NOTICE The following is meant to act as a guide to get you started, thus you may want to adjust things to suit your own particular set of equipment. (1) Where TV can decode 5.1 AC3. (2) Where AVR only has SPDIF which will support 5.1 AC3 & DTS. (3) Where AVR can do 5.1 PCM. 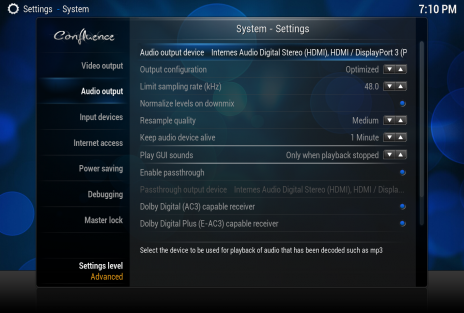 (4) Where AVR has HDMI inputs but can't decode TrueHD or DTS-HD but does support 5.1 Ac3 or DTS. (5) Where AVR has full decode capabilities including 7.1 PCM. 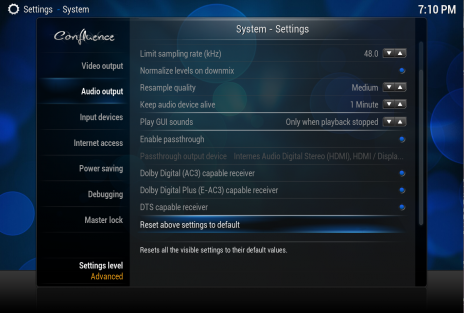 IMPORTANT: You can only have AC3, DTS, EAC3 passthrough if your Receiver supports it. Most TV's only support AC3. If you have a HDMI connection to your TV and from this TV a SPDIF/Optical connection to an AVR, passthrough might not work at all. Kodi will then pickup the device, it is named combined. Downside: The dual audio sink will only output decoded audio, you cannot use it to have one slave doing AC3/DTS and the other PCM. If you use the combined sink for normal music you will realize that direct passthrough output for your movies won't be working anymore, too. This is a pulseaudio bug, cause the combine sink is not deconstructed fast enough internally while the passthrough opening is always exclusive. It will work however if your passthrough device is not part of the device combination. Pulseaudio resamples everything that does not match the underlaying sink, so if you are an audiophile user, you perhaps want to hear your 96 / 192 khz and 24 bit recordings as exact as possible. Therefore you need to tell pulseaudio to use a better resampler in general and second change the default sample rate to 96 or 192 khz. Pulseaudio does not resample audio, that is already in the correct samplerate. Furthermore you need to take care, that your sink has a wide enough output format. Some remark: This will actively make passthrough non working, as we need s16le format for adding ac3 / dts / etc. float to the sink. The last setting will increase the resample quality from pulse and therefore the CPU load quite a lot. Again: Resampling is only done, when the sink output does not match the data you throw onto it. But as most normal mp3s are in 44.1 khz, you need to take great care when upsampling them. The overwriting of the resample-method is for this use case. Alternatively: If you don't want any resampling outside Kodi, e.g. no resampling done extra by pulse, you need to configure the sink as told above and set Audio Engine to Fixed with the number of channels you configured pulseaudio via pavucontrol and samplerate of 96 khz with resample quality high. In that combination Kodi will take care that files are resampled (e.g. 44.1 khz or 48 khz media) in the best possible quality. Already 96 khz files are not touched at all. You use your Kodi computer mainly as your Desktop when you don't run XBMC. You want other applications audio like Skype, youtube, browser mail notification in parallel with Kodi. You use Pulseaudio as a network sink to stream Audio to other devices in your living room. Passthrough is nice to have for you, but to be honest - you don't really need it. You use Kodi as your standalone media center. You are highly interested in bitperfect exclusive audio output. DTS-HD, TrueHD is something you use daily and is of high importance. You don't need other applications that would access audio in parallel. PulseAudio might hog your Audio device and you cannot open the ALSA device exclusively, therefore we decided for one or the other. Whenever PulseAudio is running your ALSA device that Kodi chooses, might be busy or even might vanish while you are using Kodi, when system sounds are playing and pulseaudio is trying to access the device again. Out of this reason we also won't implement a selection box to decide between ALSA and PULSE, because it will actively harm users. Advanced Users can go with the workaround listed beneath. Note: Doing so may cause problems! pasuspender is a tool that can be used to tell a local PulseAudio sound server to temporarily suspend access to the audio devices, to allow other applications access them directly. pasuspender will suspend access to the audio devices, fork a child process, and when the child process terminates, resume access again. You can also put the previous command in a custom .desktop-file. Be warned as this will interfere with your Desktop sounds! Audio devices are disappearing with pulseaudio 8.0 (Ubuntu 16.04, even later version are affected) especially while running kodi and while using Adjust Refreshrate to match video. This is an issue with the module-switch-on-port-available module and will be fixed with pulseaudio 9.0, the fix sadly won't probably make it into Ubuntu 16.04. As a workaround please disable that feature by editing /etc/pulse/default.pa and commenting or removing load-module module-switch-on-port-available and reboot the system. Beware: This will also forbid PA to remix e.g. FL,FR, LFE, FC, BL, BR into FL, FR, LFE, FC, SL, SR - which means you might loose your rears if your speaker layout is non standard. Starting with the upcoming kodi v17 Krypton the above behaviour is taken care within kodi. You don't have to disable remixing in pulseaudio anymore. That means content is output without further remixing by pulseaudio server if a sane mapping is possible. Basically that means if the audio is FL, FR, FC, LFE, SL, SR and your speaker-mapping is FL, FR, FC, LFE, BL, BR we will resolve that and output 6 channels accordingly. Whenever we cannot map all input channels to the output we ask pulseaudio to do the mixing for us. Issue: Changing kodi's volume will change overall system volume, especially on song change this is an irritating behaviour. The effect you hear is not done by kodi, but by a systemwide pulseaudio (mis)configuration. Some distributions sadly still ship pulseaudio with flat-volumes = yes as the default, which produces this behaviour. In fact it will cause the hardware volume (or master volume) to go up and down for every pulseaudio stream that changes its own volume. 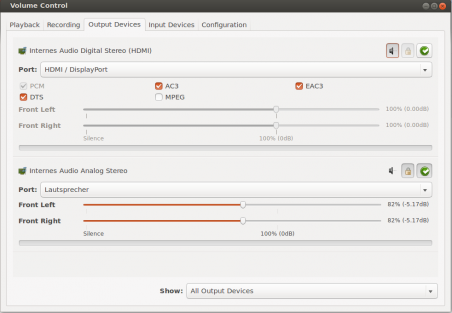 As this effect is unexpected behaviour for users, distributions started to ship pulseaudio with flat-volumes = no by default (as time of writing this is Ubuntu, Arch-Linux and others). In order to change that setting, depending on your distribution edit /etc/pulse/daemon.conf and set flat-volumes = no. After a PA server restart, the volume handling is more intuitive. If you are at it, please inform your distribution about those issues, so that they can ship a more user-friendly default with next release. At the time of writing, affected distributions: Debian. Linux - Pulseaudio Sink Discussion and further information. This page was last edited on 10 June 2018, at 10:50.